For other uses, see Sacco and Vanzetti (disambiguation). Sacco was a shoemaker and a night watchman, born April 22, 1891 in Torremaggiore, Province of Foggia, Apulia region (in Italian: Puglia), Italy, who migrated to the United States at the age of seventeen. Vanzetti was a fishmonger born June 11, 1888 in Villafalletto, Province of Cuneo, Piedmont region, who arrived in the United States at the age of twenty. Both men left Italy for the US in 1908, although they did not meet until a 1917 strike. The men were believed to be followers of Luigi Galleani, an Italian anarchist who advocated revolutionary violence, including bombing and assassination. Galleani published Cronaca Sovversiva (Subversive Chronicle), a periodical that advocated violent revolution, and a bomb-making manual called La Salute è in voi! (Health is in you!). At the time, Italian anarchists – in particular the Galleanist group – ranked at the top of the United States government's list of dangerous enemies. Since 1914, the Galleanists had been identified as suspects in several violent bombings and assassination attempts, including an attempted mass poisoning. Publication of Cronaca Sovversiva was suppressed in July 1918, and the government deported Galleani and eight of his closest associates on June 24, 1919. Remaining Galleanists remained active. For three years, perhaps 60 Galleanists waged an intermittent campaign of violence against US politicians, judges, and other federal and local officials, especially those who had supported deportation of alien radicals. Among the dozen or more violent acts was the bombing of Attorney General A. Mitchell Palmer's home on June 2, 1919. In that incident, Carlo Valdinocci, a former editor of Cronaca Sovversiva and an associate of Sacco and Vanzetti, was killed when the bomb intended for Palmer exploded in Valdinocci's hands. Radical pamphlets entitled "Plain Words" signed "The Anarchist Fighters" were found at the scene of this and several other midnight bombings that night. Several Galleanist associates were suspected or interrogated about their roles in the bombing incidents. Two days before Sacco and Vanzetti were arrested, a Galleanist named Andrea Salsedo fell to his death from the US Justice Department's Bureau of Investigation (BOI) offices on the 14th floor of 15 Park Row in New York City. Salsedo had worked in the Canzani Printshop in Brooklyn, to where federal agents traced the "Plain Words" leaflet. Roberto Elia, a fellow New York printer and admitted anarchist, was later deposed in the inquiry, and testified that Salsedo had committed suicide for fear of betraying the others. He portrayed himself as the 'strong' one who had resisted the police. According to anarchist writer Carlo Tresca, Elia changed his story later, stating that Federal agents had thrown Salsedo out the window. The Slater-Morrill Shoe Company factory was located on Pearl Street in Braintree, Massachusetts. On April 15, 1920, two men were robbed and killed while transporting the company's payroll in two large steel boxes to the main factory. One of them, Alessandro Berardelli—a security guard—was shot four times as he reached for his hip-holstered .38-caliber, Harrington & Richardson revolver; his gun was not recovered from the scene. The other man, Frederick Parmenter—a paymaster who was unarmed—was shot twice: once in the chest and a second time, fatally, in the back as he attempted to flee. The robbers seized the payroll boxes and escaped in a stolen dark blue Buick that sped up and was carrying several other men. Rather than accept court appointed counsel, Vanzetti chose to be represented by John P. Vahey, an experienced defense attorney, and James Graham, who was recommended by supporters. Frederick G. Katzmann, the Norfolk and Plymouth County District Attorney, prosecuted the case. The presiding judge was Webster Thayer, who was already assigned to the court before this case was scheduled. A few weeks earlier he had given a speech to new American citizens decrying Bolshevism and anarchism's threat to American institutions. He supported the suppression of functionally violent radical speech, and incitement to commit violent acts. He was known to dislike foreigners but was considered to be a fair judge. The trial began on June 22, 1920. The prosecution presented several witnesses who put Vanzetti at the scene of crime. Their descriptions varied, especially with respect to the shape and length of Vanzetti's mustache. Physical evidence included a shotgun shell retrieved at the scene of the crime and several shells found on Vanzetti when he was arrested. The defense produced 16 witnesses, all Italians from Plymouth, who testified that at the time of the attempted robbery they had bought eels from Vanzetti for Eastertide, in accordance with their traditions. Such details reinforced the difference between the Italians and the jurors. Some testified in imperfect English, others through an interpreter, whose inability to speak the same dialect of Italian as the witnesses hampered his effectiveness. On cross examination, the prosecution found it easy to make the witnesses appear confused about dates. A boy who testified admitted to rehearsing his testimony. "You learned it just like a piece at school?" the prosecutor asked. "Sure", he replied. The defense tried to rebut the eyewitnesses with testimony that Vanzetti always wore his mustache in a distinctive long style, but the prosecution rebutted this. The defense case went badly and Vanzetti did not testify in his own defense. During the trial, he said that his lawyers had opposed putting him on the stand. That same year, defense attorney Vahey told the governor that Vanzetti had refused his advice to testify. Decades later, a lawyer who assisted Vahey in the defense said that the defense attorneys left the choice to Vanzetti, but warned him that it would be difficult to prevent the prosecution from using cross examination to challenge the credibility of his character based on his political beliefs. He said that Vanzetti chose not to testify after consulting with Sacco. Herbert Ehrmann, who later joined the defense team, wrote many years later that the dangers of putting Vanzetti on the stand were very real. Another legal analysis of the case faulted the defense for not offering more to the jury by letting Vanzetti testify, concluding that by his remaining silent it "left the jury to decide between the eyewitnesses and the alibi witness without his aid. In these circumstances a verdict of not guilty would have been very unusual". That analysis claimed that "no one could say that the case was closely tried or vigorously fought for the defendant". Vanzetti complained during his sentencing on April 9, 1927, for the Braintree crimes, that Vahey "sold me for thirty golden money like Judas sold Jesus Christ." He accused Vahey of having conspired with the prosecutor "to agitate still more the passion of the juror, the prejudice of the juror" towards "people of our principles, against the foreigner, against slackers." On July 1, 1920, the jury deliberated for five hours and returned guilty verdicts on both counts, armed robbery and first-degree murder. Before sentencing, Judge Thayer learned that during deliberations, the jury had tampered with the shotgun shells found on Vanzetti at the time of his arrest to determine if the shot they contained was of sufficient size to kill a man. Since that prejudiced the jury's verdict on the murder charge, Thayer declared that part a mistrial. On August 16, 1920, he sentenced Vanzetti on the charge of armed robbery to a term of 12 to 15 years in prison, the maximum sentence allowed. An assessment of Thayer's conduct of the trial said "his stupid rulings as to the admissibility of conversations are about equally divided" between the two sides and thus provided no evidence of partiality. In 1927, advocates for Sacco and Vanzetti charged that this case was brought first because a conviction for the Bridgewater crimes would help convict him for the Braintree crimes, where evidence against him was weak. The prosecution countered that the timing was driven by the schedules of different courts that handled the cases. The defense raised only minor objections in an appeal that was not accepted. A few years later, Vahey joined Katzmann's law firm. Sacco and Vanzetti went on trial for their lives in Dedham, Massachusetts, May 21, 1921, at Dedham, Norfolk County for the Braintree robbery and murders. Webster Thayer again presided; he had asked to be assigned to the trial. Katzmann again prosecuted for the State. Vanzetti was represented by brothers Jeremiah and Thomas McAnraney. Sacco was represented by Fred H. Moore and William J. Callahan. The choice of Moore, a former attorney for the Industrial Workers of the World, proved a key mistake for the defense. A notorious radical from California, Moore quickly enraged Judge Thayer with his courtroom demeanor, often doffing his jacket and once, his shoes. Reporters covering the case were amazed to hear Judge Thayer, during a lunch recess, proclaim, "I'll show them that no long-haired anarchist from California can run this court!" and later, "You wait till I give my charge to the jury. I'll show them." Throughout the trial, Moore and Thayer clashed repeatedly over procedure and decorum. Authorities anticipated a possible bomb attack and had the Dedham courtroom outfitted with heavy, sliding steel doors and cast-iron shutters that were painted to appear wooden. Each day during the trial, the courthouse was placed under heavy police security, and Sacco and Vanzetti were escorted to and from the courtroom by armed guards. The Commonwealth relied on evidence that Sacco was absent from his work in a shoe factory on the day of the murders; that the defendants were in the neighborhood of the Braintree robbery-murder scene on the morning when it occurred, being identified as having been there seen separately and also together; that the Buick getaway car was also in the neighborhood and that Vanzetti was near and in it; that Sacco was seen near the scene of the murders before they occurred and also was seen to shoot Berardelli after Berardelli fell and that that shot caused his death; that used shell casings were left at the scene of the murders, some of which could have been found to have been discharged from a .32 pistol afterwards found on Sacco; that a cap was found at the scene of the murders, which witnesses identified as resembling one formerly worn by Sacco; and that both men were members of anarchist cells that espoused violence, including assassination. Among the more important witnesses called by the prosecution was salesman Carlos E. Goodridge, who stated that as the getaway car raced within twenty-five feet of him, one of the car's occupants, whom he identified as being Sacco, pointed a gun in his direction. Both defendants offered alibis that were backed by several witnesses. Vanzetti testified that he had been selling fish at the time of the Braintree robbery. Sacco testified that he had been in Boston applying for a passport at the Italian consulate. He stated he had lunched in Boston's North End with several friends, each of whom testified on his behalf. Prior to the trial, Sacco's lawyer, Fred Moore, went to great lengths to contact the consulate employee whom Sacco said he had talked with on the afternoon of the crime. Once contacted in Italy, the clerk said he remembered Sacco because of the unusually large passport photo he presented. The clerk also remembered the date, April 15, 1920, but he refused to return to the United States to testify (a trip requiring two ship voyages), citing his ill health. Instead he executed a sworn deposition that was read aloud in court and quickly dismissed. Much of the trial focused on material evidence, notably bullets, guns, and the cap. Prosecution witnesses testified that Bullet III, the .32-caliber bullet that had fatally wounded Berardelli, was from a discontinued Winchester .32 Auto cartridge loading so obsolete that the only bullets similar to it that anyone could locate to make comparisons were those found in the cartridges in Sacco's pockets. Prosecutor Frederick Katzmann decided to participate in a forensic bullet examination using bullets test-fired from Sacco's .32 Colt Automatic after the defense arranged for such tests. Sacco, saying he had nothing to hide, had allowed his gun to be test-fired, with experts for both sides present, during the trial's second week. The prosecution matched bullets fired through the gun to those taken from one of the slain men. In court, District Attorney Katzmann called two forensic gun expert witnesses, Capt. Charles Van Amburgh of Springfield Armory and Capt. William Proctor of the Massachusetts State Police, who testified that they believed that of the four bullets recovered from Berardelli's body, Bullet III – the fatal bullet – exhibited rifling marks consistent with those found on bullets fired from Sacco's .32 Colt Automatic pistol. In rebuttal, two defense forensic gun experts would later testify that Bullet III did not match any of the test bullets from Sacco's Colt. Capt. Proctor would later sign an affidavit stating that he could not positively identify Sacco's .32 Colt as the only pistol that could have fired Bullet III. 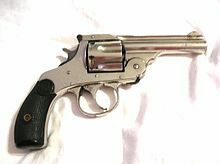 This meant that Bullet III could have been fired from any of the 300,000 .32 Colt Automatic pistols then in circulation. Noting all the witnesses to the shooting testified that they saw one gunman shoot Berardelli four times, the defense questioned how only one of four bullets found in the deceased guard was identified as being fired from Sacco's Colt. Vanzetti was being tried under Massachusetts' felony-murder rule, and the prosecution sought to implicate him in the Braintree robbery by the testimony of several witnesses: one testified that he was in the getaway car, and others who stated they saw Vanzetti in the vicinity of the Braintree factory around the time of the robbery. No direct evidence tied Vanzetti's .38 nickel-plated Harrington & Richardson five-shot revolver to the crime scene, except for the fact that it was identical in type and appearance to one owned by the slain guard Berardelli, which was missing from the crime scene. All six bullets recovered from the victims were .32 caliber, fired from at least two different automatic pistols. Vanzetti, however, carried a .38-caliber revolver. The prosecution claimed Vanzetti's .38 revolver had originally belonged to the slain Berardelli, and that it had been taken from his body during the robbery. No one testified to seeing anyone take the gun, but Berardelli had an empty holster and no gun on him when he was found. Additionally, witnesses to the payroll shooting had described Berardelli as reaching for his gun on his hip when he was cut down by pistol fire from the robbers. District Attorney Katzmann pointed out that Vanzetti had lied at the time of his arrest, when making statements about the .38 revolver found in his possession. He claimed that the revolver was his own, and that he carried it for self-protection, yet he incorrectly described it to police as a six-shot revolver instead of a five-shot. Vanzetti also told police that he had purchased only one box of cartridges for the gun, all of the same make, yet his revolver was loaded with five .38 cartridges of varying brands. At the time of his arrest, Vanzetti also claimed that he had bought the gun at a store (but could not remember which one), and that it cost $18 or $19 (three times its actual market value). He lied about where he had obtained the .38 cartridges found in the revolver. In an attempt to show that Vanzetti's revolver was taken from the slain Berardelli, the prosecution traced the history of Berardelli's .38 Harrington & Richardson (H&R) revolver. Berardelli's wife testified that she and her husband dropped off the gun for repair at the Iver Johnson Co. of Boston a few weeks before the murder. According to the foreman of the Iver Johnson repair shop, Berardelli's revolver was given a repair tag with the number of 94765, and this number was recorded in the repair logbook with the statement "H. & R. revolver, .38-calibre, new hammer, repairing, half an hour". However, the shop books did not record the gun's serial number, and the caliber was apparently incorrectly labeled as .32 instead of .38-caliber. The shop foreman testified that a new spring and hammer were put into Berardelli's Harrington & Richardson revolver. The gun was claimed and the half-hour repair paid for, though the date and identity of the claimant were not recorded. After examining Vanzetti's .38 revolver, the foreman testified that Vanzetti's gun had a new replacement hammer in keeping with the repair performed on Berardelli's revolver. The foreman explained that the shop was always kept busy repairing 20 to 30 revolvers per day, which made it very hard to remember individual guns or keep reliable records of when they were picked up by their owners. But, he said that unclaimed guns were sold by Iver Johnson at the end of each year, and the shop had no record of an unclaimed gun sale of Berardelli's revolver. To reinforce the conclusion that Berardelli had reclaimed his revolver from the repair shop, the prosecution called a witness who testified that he had seen Berardelli in possession of a .38 nickel-plated revolver the Saturday night before the Braintree robbery. After hearing testimony from the repair shop employee that "the repair shop had no record of Berardelli picking up the gun, the gun was not in the shop nor had it been sold", the defense put Vanzetti on the stand where he testified that "he had actually bought the gun several months earlier from fellow anarchist Luigi Falzini for five dollars" – in contradiction to what he had told police upon his arrest. This was corroborated by Luigi Falzini (Falsini), a friend of Vanzetti's and a fellow Galleanist, who stated that, after buying the .38 revolver from one Riccardo Orciani, he sold it to Vanzetti. The defense also called two expert witnesses, a Mr. Burns and a Mr. Fitzgerald, who each testified that no new spring and hammer had ever been installed in the revolver found in Vanzetti's possession. The District Attorney's final piece of material evidence was a flop-eared cap claimed to have been Sacco's. Sacco tried the cap on in court and, according to two newspaper sketch artists who ran cartoons the next day, it was too small, sitting high on his head. But Katzmann insisted the cap fitted Sacco and, noting a hole in the back where Sacco had hung the cap on a nail each day, continued to refer to it as his, and in denying later appeals, Judge Thayer often cited the cap as material evidence. During the 1927 Lowell Commission investigation, however, Braintree's Police Chief admitted that he had torn the cap open upon finding it at the crime scene a full day after the murders. Doubting the cap was Sacco's, the chief told the commission it could not have lain in the street "for thirty hours with the State Police, the local police, and two or three thousand people there." Viewing the scene from a distance of from sixty to eighty feet, she saw a man previously unknown to her in a car traveling at the rate of from fifteen to eighteen miles per hour, and she saw him only for a distance of about thirty feet—that is to say, for from one and a half to three seconds. Yet cross examination revealed that Splaine was unable to identify Sacco at the inquest but had recall of great details of Sacco's appearance over a year later. While a few others singled out Sacco or Vanzetti as the men they had seen at the scene of the crime, far more witnesses, both prosecution and defense, could not identify them. The defendants' radical politics may have played a role in the verdict. Judge Thayer, though a sworn enemy of anarchists, warned the defense against bringing anarchism into the trial. Yet defense attorney Fred Moore felt he had to call both Sacco and Vanzetti as witnesses to let them explain why they were fully armed when arrested. Both men testified that they had been rounding up radical literature when apprehended, and that they had feared another government deportation raid. Yet both hurt their case with rambling discourses on radical politics that the prosecution mocked. The prosecution also brought out that both men had fled the draft by going to Mexico in 1917. On July 21, 1921, the jury deliberated for three hours, broke for dinner, and then returned the guilty verdicts. Supporters later insisted that Sacco and Vanzetti had been convicted for their anarchist views, yet every juror insisted that anarchism had played no part in their decision to convict the two men. At that time, a first-degree murder conviction in Massachusetts was punishable by death. Sacco and Vanzetti were bound for the electric chair unless the defense could find new evidence. The verdicts and the likelihood of death sentences immediately roused international opinion. Demonstrations were held in 60 Italian cities and a flood of mail was sent to the American embassy in Paris. Demonstrations followed in a number of Latin American cities. Anatole France, veteran of the campaign for Alfred Dreyfus and recipient of the 1921 Nobel Prize for Literature, wrote an "Appeal to the American People": "The death of Sacco and Vanzetti will make martyrs of them and cover you with shame. You are a great people. You ought to be a just people." In 1921, most of the nation had not yet heard of Sacco and Vanzetti. Brief mention of the conviction appeared on page three of the New York Times. Defense attorney Moore radicalized and politicized the process by discussing Sacco and Vanzetti's anarchist beliefs, attempting to suggest that they were prosecuted primarily for their political beliefs and the trial was part of a government plan to stop the anarchist movement in the United States. His efforts helped stir up support but was so costly that he was eventually dismissed from the defense team. The Sacco-Vanzetti Defense Committee was formed on May 9, 1920, immediately following the arrests, by a group of fellow anarchists, headed by Vanzetti's 23-year-old friend Aldino Felicani. Over the next seven years, it raised $300,000. Defense attorney Fred Moore drew on its funds for his investigations. Differences arose when Moore tried to determine who had committed the Braintree crimes over objections from anarchists that he was doing the government's work. 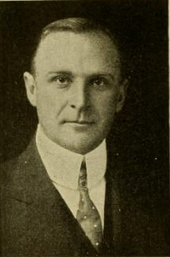 After the Committee hired William G. Thompson to manage the legal defense, he objected to its propaganda efforts. A Defense Committee publicist wrote an article about the first trial that was published in The New Republic. In the winter of 1920–1921, the Defense Committee sent stories to labor union publications every week. It produced pamphlets with titles like Fangs at Labor's Throat, sometimes printing thousands of copies. It sent speakers to Italian communities in factory towns and mining camps. The Committee eventually added staff from outside the anarchist movement, notably Mary Donovan, who had experience as a labor leader and Sinn Féin organizer. In 1927, she and Felicani together recruited Gardner Jackson, a Boston Globe reporter from a wealthy family, to manage publicity and serve as a mediator between the Committee's anarchists and the growing number of supporters with more liberal political views, who included socialites, lawyers, and intellectuals. We are one heart, but unfortunately we represent two different class. ... But, whenever the heart of one of the upper class join with the exploited workers for the struggle of the right in the human feeling is the feel of an spontaneous attraction and brotherly love to one another. The noted American author John Dos Passos joined the committee and wrote its 127-page official review of the case: Facing the Chair: Story of Americanization of Two Foreignborn Workmen. Dos Passos concluded it "barely possible" that Sacco might have committed murder as part of a class war, but that the soft-hearted Vanzetti was clearly innocent. "Nobody in his right mind who was planning such a crime would take a man like that along," Dos Passos wrote of Vanzetti. After the executions, the Committee continued its work, helping to gather material that eventually appeared as The Letters of Sacco and Vanzetti. Multiple separate motions for a new trial were denied by Judge Thayer. One motion, the so-called Hamilton-Proctor motion, involved the forensic ballistic evidence presented by the expert witnesses for the prosecution and defense. The prosecution's firearms expert, Charles Van Amburgh, had re-examined the evidence in preparation for the motion. By 1923, bullet comparison technology had improved somewhat, and Van Amburgh submitted photos of the bullets fired from Sacco's .32 Colt in support of the argument that they matched the bullet that killed Berardelli. In response, the controversial self-proclaimed "firearms expert" for the defense, Albert H. Hamilton, conducted an in-court demonstration involving two brand new Colt .32-caliber automatic pistols belonging to Hamilton, along with Sacco's .32 Colt of the same make and caliber. In front of Judge Thayer and the lawyers for both sides, Hamilton disassembled all three pistols and placed the major component parts – barrel, barrel bushing, recoil spring, frame, slide, and magazine – into three piles on the table before him. He explained the functions of each part and began to demonstrate how each was interchangeable, in the process intermingling the parts of all three pistols. Judge Thayer stopped Hamilton and demanded that he reassemble Sacco's pistol with its proper parts. Other motions focused on the jury foreman and a prosecution ballistics expert. In 1923, the defense filed an affidavit from a friend of the jury foreman, who swore that prior to the trial, the jury foreman had allegedly said of Sacco and Vanzetti, "Damn them, they ought to hang them anyway!" That same year, the defense read to the court an affidavit by Captain William Proctor (who had died shortly after conclusion of the trial) in which Proctor stated that he could not say that Bullet III was fired by Sacco's .32 Colt pistol. At the conclusion of the appeal hearings, Thayer denied all motions for a new trial on October 1, 1924. Several months later, in February 1924, Judge Thayer asked one of the firearms experts for the prosecution, Capt. Charles Van Amburgh, to reinspect Sacco's Colt and determine its condition. With District Attorney Katzmann present, Van Amburgh took the gun from the clerk and started to take it apart. Van Amburgh quickly noticed that the barrel to Sacco's gun was brand new, being still covered in the manufacturer's protective rust preventative. Judge Thayer began private hearings to determine who had tampered with the evidence by switching the barrel on Sacco's gun. During three weeks of hearings, Albert Hamilton and Captain Van Amburgh squared off, challenging each other's authority. Testimony suggested that Sacco's gun had been treated with little care, and frequently disassembled for inspection. New defense attorney William Thompson insisted that no one on his side could have switched the barrels "unless they wanted to run their necks into a noose." Albert Hamilton swore he had only taken the gun apart while being watched by Judge Thayer. Judge Thayer made no finding as to who had switched the .32 Colt barrels, but ordered the rusty barrel returned to Sacco's Colt. After the hearing concluded, unannounced to Judge Thayer, Captain Van Amburgh took both Sacco's and Vanzetti's guns, along with the bullets and shells involved in the crime to his home where he kept them until a Boston Globe exposé revealed the misappropriation in 1960. Meanwhile, Van Amburgh bolstered his own credentials by writing an article on the case for True Detective Mysteries. The 1935 article charged that prior to the discovery of the gun barrel switch, Albert Hamilton had tried to walk out of the courtroom with Sacco's gun but was stopped by Judge Thayer. Although several historians of the case, including Francis Russell, have reported this story as factual, nowhere in transcripts of the private hearing on the gun barrel switch was this incident ever mentioned. The same year the True Detective article was published, a study of ballistics in the case concluded, "what might have been almost indubitable evidence was in fact rendered more than useless by the bungling of the experts." The defense appealed Thayer's denial of their motions to the Supreme Judicial Court (SJC), the highest level of the state's judicial system. Both sides presented arguments to its five judges on January 11–13, 1926. The SJC returned a unanimous ruling on May 12, 1926, upholding Judge Thayer's decisions. The Court did not have the authority to review the trial record as a whole or to judge the fairness of the case. Instead, the judges considered only whether Thayer had abused his discretion in the course of the trial. Thayer later claimed that the SJC had "approved" the verdicts, which advocates for the defendants protested as a misinterpretation of the Court's ruling, which only found "no error" in his individual rulings. In November 1925, Celestino Medeiros, an ex-convict awaiting trial for murder, confessed to committing the Braintree crimes. He absolved Sacco and Vanzetti of participation. In May, once the SJC had denied their appeal and Medeiros was convicted, the defense investigated the details of Medeiros' story. Police interviews led them to the Morelli gang based in Providence, Rhode Island. They developed an alternative theory of the crime based on the gang's history of shoe-factory robberies, connections to a car like that used in Braintree, and other details. Gang leader Joe Morelli bore a striking resemblance to Sacco. The defense filed a motion for a new trial based on the Medeiros confession on May 26, 1926. In support of their motion they included 64 affidavits. The prosecution countered with 26 affidavits. When Thayer heard arguments from September 13 to 17, 1926, the defense, along with their Medeiros-Morelli theory of the crime, charged that the U.S. Justice Department was aiding the prosecution by withholding information obtained in its own investigation of the case. Attorney William Thompson made an explicitly political attack: "A government which has come to value its own secrets more than it does the lives of its citizens has become a tyranny, whether you call it a republic, a monarchy, or anything else!" Judge Thayer denied this motion for a new trial on October 23, 1926. After arguing against the credibility of Medeiros, he addressed the defense claims against the federal government, saying the defense was suffering from "a new type of disease, ... a belief in the existence of something which in fact and truth has no such existence." Three days later, the Boston Herald responded to Thayer's decision by reversing its longstanding position and calling for a new trial. Its editorial, "We Submit", earned its author a Pulitzer Prize. No other newspapers followed suit. The defense promptly appealed again to the Supreme Judicial Court and presented their arguments on January 27 and 28, 1927. While the appeal was under consideration, Harvard law professor and future Supreme Court Justice Felix Frankfurter published an article in the Atlantic Monthly arguing for a retrial. He noted that the SJC had already taken a very narrow view of its authority when considering the first appeal, and called upon the court to review the entire record of the case. He called their attention to Thayer's lengthy statement that accompanied his denial of the Madeiros appeal, describing it as "a farrago of misquotations, misrepresentations, suppressions, and mutilations," "honeycombed with demonstrable errors." At the same time, Major Calvin Goddard was a ballistics expert who had helped pioneer the use of the comparison microscope in forensic ballistic research. He offered to conduct an independent examination of the gun and bullet forensic evidence by using techniques that he had developed for use with the comparison microscope. Goddard first offered to conduct a new forensic examination for the defense, which rejected it, and then to the prosecution, which accepted his offer. Using the comparison microscope, Goddard compared Bullet III and a .32 Auto shell casing found at the Braintree shooting with that of several .32 Auto test cartridges fired from Sacco's .32 Colt automatic pistol. Goddard concluded that not only did Bullet III match the rifling marks found on the barrel of Sacco's .32 Colt pistol, but that scratches made by the firing pin of Sacco's .32 Colt on the primers of spent shell casings test-fired from Sacco's Colt matched those found on the primer of a spent shell casing recovered at the Braintree murder scene. More sophisticated comparative examinations in 1935, 1961, and 1983 each reconfirmed the opinion that the bullet the prosecution said killed Berardelli, and one of the cartridge cases introduced into evidence, were fired in Sacco's .32 Colt automatic. However, in his book on new evidence in the Sacco and Vanzetti case, historian David E. Kaiser wrote that Bullet III and its shell casing, as presented, had been substituted by the prosecution and were not genuinely from the scene. The Supreme Judicial Court denied the Madeiros appeal on April 5, 1927. Summarizing the decision, The New York Times said that the SJC had determined that "the judge had a right to rule as he did" but that the SJC "did not deny the validity of the new evidence." The SJC also said: "It is not imperative that a new trial be granted even though evidence is newly discovered and, if presented to a jury, would justify a different verdict." Many socialists and intellectuals campaigned for a retrial without success. John Dos Passos came to Boston to cover the case as a journalist, stayed to author a pamphlet called Facing the Chair, and was arrested in a demonstration on August 10, 1927, along with Dorothy Parker. After being arrested while picketing the State House, the poet Edna St. Vincent Millay pleaded her case to the governor in person and then wrote an appeal: "I cry to you with a million voices: answer our doubt ... There is need in Massachusetts of a great man tonight." Others who wrote to Fuller or signed petitions included Albert Einstein, George Bernard Shaw and H. G. Wells. The president of the American Federation of Labor cited "the long period of time intervening between the commission of the crime and the final decision of the Court" as well as "the mental and physical anguish which Sacco and Vanzetti must have undergone during the past seven years" in a telegram to the governor. Benito Mussolini, the target of two anarchist assassination attempts, quietly made inquiries through diplomatic channels and was prepared to ask Governor Fuller to commute the sentences if it appeared his request would be granted. In 1926, a bomb presumed to be the work of anarchists destroyed the house of Samuel Johnson, the brother of Simon Johnson and owner of the garage that called police the night of Sacco and Vanzetti's arrest. In August 1927, the Industrial Workers of the World (IWW) called for a three-day nationwide walkout to protest the pending executions. The most notable response came in the Walsenburg coal district of Colorado, where 1,132 out of 1,167 miners participated in the walkout. It led to the Colorado coal strike of 1927. For their part, Sacco and Vanzetti seemed to alternate between moods of defiance, vengeance, resignation, and despair. The June 1926 issue of Protesta Umana, published by their Defense Committee, carried an article signed by Sacco and Vanzetti that appealed for retaliation by their colleagues. In the article, Vanzetti wrote, "I will try to see Thayer death [sic] before his pronunciation of our sentence," and asked fellow anarchists for "revenge, revenge in our names and the names of our living and dead." The article concluded by urging readers to recall La Salute è in voi!, Galleani's bomb-making manual. Both wrote dozens of letters asserting their innocence, insisting they had been framed because they were anarchists. Their conduct in prison consistently impressed guards and wardens. In 1927, the Dedham jail chaplain wrote to the head of an investigatory commission that he had seen no evidence of guilt or remorse on Sacco's part. 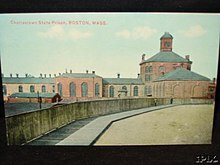 Vanzetti impressed fellow prisoners at Charlestown State Prison as a bookish intellectual, incapable of committing any violent crime. Novelist John Dos Passos, who visited both men in jail, observed of Vanzetti, "nobody in his right mind who was planning such a crime would take a man like that along." Vanzetti developed his command of English to such a degree that journalist Murray Kempton later described him as "the greatest writer of English in our century to learn his craft, do his work, and die all in the space of seven years." The Sacco e Vanzetti monument in Carrara. Italian anarchist Severino Di Giovanni, one of the most vocal supporters of Sacco and Vanzetti in Argentina, bombed the American embassy in Buenos Aires a few hours after the two men were sentenced to death. A few days after the executions, Sacco's widow thanked Di Giovanni by letter for his support and added that the director of the tobacco firm Combinados had offered to produce a cigarette brand named "Sacco & Vanzetti". On November 26, 1927, Di Giovanni and others bombed a Combinados tobacco shop. On December 24, 1927, Di Giovanni blew up the headquarters of The National City Bank of New York and of the Bank of Boston in Buenos Aires in apparent protest of the execution. In December 1928, Di Giovanni and others failed in an attempt to bomb the train in which President-elect Herbert Hoover was traveling during his visit to Argentina. Three months later, bombs exploded in the New York City Subway, in a Philadelphia church, and at the home of the mayor of Baltimore. The house of one of the jurors in the Dedham trial was bombed, throwing him and his family from their beds. On May 18, 1928, a bomb destroyed the front porch of the home of executioner Robert Elliott. As late as 1932, Judge Thayer's home was wrecked and his wife and housekeeper were injured in a bomb blast. Afterward, Thayer lived permanently at his club in Boston, guarded 24 hours a day until his death on April 18, 1933. The guilt or innocence of these two Italians is not the issue that has excited the opinion of the world. Possibly they were actual murderers, and still more possibly they knew more than they would admit about the crime. ... Europe is not "retrying" Sacco and Vanzetti or anything of the sort. It is saying what it thinks of Judge Thayer. Executing political opponents as political opponents after the fashion of Mussolini and Moscow we can understand, or bandits as bandits; but this business of trying and executing murderers as Reds, or Reds as murderers, seems to be a new and very frightening line for the courts of a State in the most powerful and civilized Union on earth to pursue. He used the case to complain that Americans were too sensitive to foreign criticism: "One can scarcely let a sentence that is not highly flattering glance across the Atlantic without some American blowing up." In 1928, Upton Sinclair published his novel Boston, an indictment of the American judicial system. He explored Vanzetti's life and writings, as its focus, and mixed fictional characters with historical participants in the trials. Though his portrait of Vanzetti was entirely sympathetic, Sinclair disappointed advocates for the defense by failing to absolve Sacco and Vanzetti of the crimes, however much he argued that their trial had been unjust. Years later, he explained: "Some of the things I told displeased the fanatical believers; but having portrayed the aristocrats as they were, I had to do the same thing for the anarchists." While doing research for the book, Sinclair was told confidentially by Sacco and Vanzetti's former lawyer Fred H. Moore that the two were guilty and that he (Moore) had supplied them with fake alibis; Sinclair was inclined to believe that that was, indeed, the case, and later referred to this as an "ethical problem", but he did not include the information about the conversation with Moore in his book. When the letters Sacco and Vanzetti wrote appeared in print in 1928, journalist Walter Lippmann commented: "If Sacco and Vanzetti were professional bandits, then historians and biographers who attempt to deduce character from personal documents might as well shut up shop. By every test that I know of for judging character, these are the letters of innocent men." On January 3, 1929, as Gov. Fuller left the inauguration of his successor, he found a copy of the Letters thrust at him by someone in the crowd. He knocked it to the ground "with an exclamation of contempt." Intellectual and literary supporters of Sacco and Vanzetti continued to speak out. In 1936, on the day when Harvard celebrated its 300th anniversary, 28 Harvard alumni issued a statement attacking the University's retired President Lowell for his role on the Governor's Advisory Committee in 1927. They included Heywood Broun, Malcolm Cowley, Granville Hicks, and John Dos Passos. Following the SJC's assertion that it could not order a new trial even if there was new evidence that "would justify a different verdict," a movement for "drastic reform" quickly took shape in Boston's legal community. In December 1927, four months after the executions, the Massachusetts Judicial Council cited the Sacco and Vanzetti case as evidence of "serious defects in our methods of administering justice." It proposed a series of changes designed to appeal to both sides of the political divide, including restrictions on the number and timing of appeals. Its principal proposal addressed the SJC's right to review. It argued that a judge would benefit from a full review of a trial, and that no one man should bear the burden in a capital case. A review could defend a judge whose decisions were challenged and make it less likely that a governor would be drawn into a case. It asked for the SJC to have right to order a new trial "upon any ground if the interests of justice appear to inquire it." Governor Fuller endorsed the proposal in his January 1928 annual message. Many historians, especially legal historians, have concluded the Sacco and Vanzetti prosecution, trial, and aftermath constituted a blatant disregard for political civil liberties, and especially criticize Thayer's decision to deny a retrial. John W. Johnson has said that the authorities and jurors were influenced by strong anti-Italian prejudice and the prejudice against immigrants widely held at the time, especially in New England. Against charges of racism and racial prejudice, Paul Avrich and Brenda and James Lutz point out that both men were known anarchist members of a militant organization, members of which had been conducting a violent campaign of bombing and attempted assassinations, acts condemned by most Americans of all backgrounds. Though in general anarchist groups did not finance their militant activities through bank robberies, a fact noted by the investigators of the Bureau of Investigation, this was not true of the Galleanist group. Mario Buda readily told an interviewer: "Andavamo a prenderli dove c'erano" ("We used to go and get it [money] where it was") – meaning factories and banks. The guard Berardelli was also Italian. Johnson and Avrich suggest that the government prosecuted Sacco and Vanzetti for the robbery-murders as a convenient means to put a stop to their militant activities as Galleanists, whose bombing campaign at the time posed a lethal threat, both to the government and to many Americans. Faced with a secretive underground group whose members resisted interrogation and believed in their cause, Federal and local officials using conventional law enforcement tactics had been repeatedly stymied in their efforts to identify all members of the group or to collect enough evidence for a prosecution. Most historians believe that Sacco and Vanzetti were involved at some level in the Galleanist bombing campaign, although their precise roles have not been determined. In 1955, Charles Poggi, a longtime anarchist and American citizen, traveled to Savignano in the Emilia-Romagna region of Italy to visit old comrades, including the Galleanists' principal bombmaker, Mario "Mike" Buda. While discussing the Braintree robbery, Buda told Poggi, "Sacco c'era" (Sacco was there). Poggi added that he "had a strong feeling that Buda himself was one of the robbers, though I didn't ask him and he didn't say." Whether Buda and Ferruccio Coacci, whose shared rental house contained the manufacturer's diagram of a .32 Savage automatic pistol (matching the .32 Savage pistol believed to have been used to shoot both Berardelli and Parmenter), had also participated in the Braintree robbery and murders would remain a matter of speculation. A monument to the trial of Sacco and Vanzetti outside the Norfolk Superior Court in Dedham, Massachusetts. A memorial committee tried to present a plaster cast executed in 1937 by Gutzon Borglum, the sculptor of Mount Rushmore, to Massachusetts governors and Boston mayors in 1937, 1947, and 1957 without success. On August 23, 1997, on the 70th anniversary of the Sacco and Vanzetti executions, Boston's first Italian-American Mayor, Thomas Menino, and the Italian-American Governor of Massachusetts, Paul Cellucci, unveiled the work at the Boston Public Library, where it remains on display. The city's acceptance of this piece of artwork is not intended to reopen debate about the guilt or innocence of Sacco and Vanzetti," Menino said. "It is intended to remind us of the dangers of miscarried justice, and the right we all have to a fair trial. The event occasioned a renewed debate about the fairness of the trial in the editorial pages of the Boston Herald. 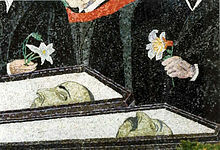 A mosaic mural portraying the trial of Sacco and Vanzetti is installed on the main campus of Syracuse University. 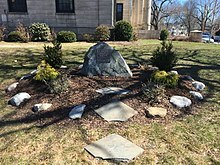 In Braintree, Massachusetts on the corner of French Avenue and Pearl Street, a memorial marks the site of the murders. The memorial has two exhibits. The first is a weatherproof poster that discusses the crime and the subsequent trial. The second exhibit is a metal plaque that memorializes the victims of the crime. 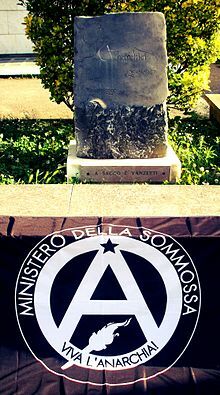 The "Sacco and Vanzetti Centuria" was an American anarchist military unit in the Durruti Column that fought in the Spanish Civil War. Many sites in the former USSR are named after "Sacco and Vanzetti": for example, a beer production facility in Moscow, a kolkhoz in Donetsk region, Ukraine; and a street and an apartment complex in Yekaterinburg. ; 'Sacco and Vanzetti' was also a popular brand of Russian pencil from 1930–2007. Numerous towns in Italy have streets named after Sacco and Vanzetti, including Via Sacco-Vanzetti in Torremaggiore, Sacco's home town; and Villafalletto, Vanzetti's. In 2017, as part of an Eagle Scout project, a plaque was placed outside of Norfolk Superior Court commemorating the trial. James Thurber and Elliot Nugent's 1940 play The Male Animal turns on a college professor's insistence on reading Vanzetti's statement at sentencing to his English composition class. It was adapted as a film the next year, starring Henry Fonda and Olivia de Havilland. In 1999, People's Light & Theatre Company in Malvern, Pennsylvania premiered Louis Lippa's play, Sacco and Vanzetti: A Vaudeville. Directed by co-founder Ken Marini, it featured long-time company members Tom Teti and Stephen Novelli. It subsequently received productions at City Theatre of Pittsburgh; the Marin Theatre Company, San Francisco; and the Gorilla Theatre of Tampa Bay. In 2000, the play Voices on the Wind by Eric Paul Erickson centers around the final hours of the lives of Sacco and Vanzetti. Former Massachusetts Governor Michael Dukakis recorded an audio clip of his public statement on the 50th anniversary for the production. In 2001, Anton Coppola premiered his opera Sacco and Vanzetti. In 2014, Joseph Silovsky wrote and performed in an Off-Broadway play about Sacco and Vanzetti, Send for the Million Men. The Sacco-Vanzetti Story was presented on television in 1960. The two-part drama starred Martin Balsam as Sacco and Steven Hill as Vanzetti. Sacco e Vanzetti, a 1971 film by Italian director Giuliano Montaldo covers the case. Joan Baez performed the song "Here's To You" (music by Ennio Morricone, lyrics by Baez) for the film. This same song was later used in the 2014 video game Metal Gear Solid V: Ground Zeroes. The 2006 documentary Sacco and Vanzetti was directed by Peter Miller. Produced by Peter Miller and Editor Amy Linton, the film presents interviews with researchers and historians of the lives of Nicola Sacco and Bartolomeo Vanzetti, and their trial. It also presents forensic evidence that refutes that used by the prosecution during the trial. Prison letters written by the defendants are read by voice actors with Tony Shalhoub as Sacco and John Turturro as Vanzetti. Interviewees include Howard Zinn, Studs Terkel, and Arlo Guthrie. The Sopranos episode The Legend of Tennessee Moltisanti briefly mentions their names while the Soprano family is eating dinner, discussing famous Italian-Americans. In 1932, composer Ruth Crawford Seeger wrote the song "Sacco, Vanzetti" on commission from the Society of Contemporary Music in Philadelphia. In 1963, Pulitzer Prize-winning American composer Roger Reynolds set selections of Vanzetti's letters to music in the chamber work Portrait of Vanzetti for narrator, mixed ensemble, and electronics. When he died in 1964, American composer Marc Blitzstein was working on an opera about Sacco and Vanzetti, which Leonard Lehrman completed. In 1971, Georges Moustaki adapted the Ennio Morricone/Joan Baez song "Here's to you" under the new title of "Marche de Sacco et Vanzetti" for his album Il y avait un jardin (There was a garden). In 1976, the German folkgroup Manderley included the song "Sacco's Brief" (Sacco's Letter) on their album Fliegt, Gedanken, fliegt. American singer Woody Guthrie recorded a series of songs known as the Ballads of Sacco & Vanzetti. The music video for the song "No Shelter" by American rap metal band Rage Against the Machine, shows the executions of both Sacco & Vanzetti and the Scottsboro Boys, both being historical examples of unfair trials. American folk singer Charles King wrote the song "Two Good Arms" about Sacco & Vanzetti in 1977 on the fiftieth anniversary of their death. The song has been performed by Holly Near and Ronnie Gilbert. On his 1972 album FM & AM, George Carlin made reference to a new musical supergroup named Crosby, Stills, Nash, Young, Merrill, Lynch, Pierce, Sacco & Vanzetti. Upton Sinclair's 1928 book, Boston, is a fictional interpretation of the affair. H. G. Wells's 1928 book, Mr. Blettsworthy on Rampole Island, refers to the case and the main character's reaction to it. In the early 1930s, Ben Shahn produced a series of works related to the case, notably The Passion of Sacco and Vanzetti, owned by the Whitney Museum of American Art in New York City. A similar sixty-by-twelve-foot mural by Shahn, executed in marble and enamel, is installed on the east wall of Huntington Beard Crouse Hall at Syracuse University. The chapter 'Holding the Fort: The Night Sacco and Vanzetti Died' of Frank Moorhouse's 1993 novel, Grand Days, depicts the violent demonstrations in Geneva following the execution. In 1935, Maxwell Anderson's award-winning drama Winterset presented the story of a man who attempts to clear the name of his Italian immigrant father who has been executed for robbery and murder. It was adapted as a feature film a year later. In 1936, the third novel in John Dos Passos' U.S.A. trilogy, The Big Money, Mary French works on the Sacco and Vanzetti Defense Committee and is arrested protesting their imminent executions. James T. Farrell's 1946 novel Bernard Clare uses the anti-Italian sentiment provoked by coverage of the case and the crowd scene in New York City's Union Square awaiting news of the executions as critical plot elements. Mark Binelli presented the two as a Laurel-and-Hardy-like comedy team in the 2006 novel Sacco And Vanzetti Must Die! The trial is discussed in detail in Kurt Vonnegut's 1979 novel Jailbird, in which Vonnegut suggests that the case - especially Madeiros' confession - is a modern day parallel to the crucifixion of Jesus. In the novel Vita Nostra by Marina and Sergey Dyachenko (Maryna and Serhiy Dyachenko) the Institute for Special Technologies is on Sacco and Vanzetti street. John Dos Passos wrote the poem "They Are Dead Now," about the executions of Sacco and Vanzetti. In his poem "America", Allen Ginsberg presents a catalog of slogans that includes the line: "Sacco and Vanzetti must not die". Carl Sandburg described the execution of Sacco and Vanzetti in his poem "Legal Midnight Hour". Edna St. Vincent Millay wrote a poem after the executions titled "Justice Denied In Massachusetts". William Carlos Williams wrote a poem entitled "Impromptu: The Suckers" in response to the trial. ^ a b c "Sacco and Vanzetti Put to Death Early This Morning". New York Times. 23 August 1927. Retrieved 9 July 2010. ^ Michael A. Musmano (January 1961). The Sacco-Vanzetti Case: A Miscarriage of Justice. 47 No. 1. American Bar Association. p. 29,30. Retrieved 3 October 2015. ^ Avrich, Paul (1996). Sacco and Vanzetti: The Anarchist Background. Princeton University Press. pp. 13, 31. ISBN 9780691026046. ^ Aiuto, Russell. "The Legacy of Sacco & Vanzetti". truTV. Retrieved 9 July 2010. ^ a b "The Sacco-Vanzetti Case (overview)". upenn.edu. ^ a b McCormick, Charles H., Hopeless Cases, The Hunt For The Red Scare Terrorist Bombers, Lanham, Maryland: University Press of America, pp. 60–61. Quote: "Elia claims to have been soundly asleep when Salsedo allegedly climbed out the window a few feet away from him, then silently jumped into eternity. Nor did he hear the agents running into his room to find out what had happened; he was snoring loudly when they entered." ^ a b c d e f g h i j k l m Reed, Barry C. (1960). "The Sacco-Vanzetti Case: The Trial of the Century". American Bar Association Journal. 46 (8): 867–869. ISSN 0002-7596. JSTOR 25721262. ^ Frankfurter, Felix. "The Case of Sacco and Vanzetti". The Atlantic. The Atlantic Monthly Group. Retrieved 2 October 2015. ^ Michael A. Musmano (January 1961). The Sacco-Vanzetti Case: A Miscarriage of Justice. 47. American Bar Association. p. 29. Retrieved 3 October 2015. ^ "Bomb For Herrick Wounds His Valet In His Paris Home," New York Times,19 October 1921. Note: Years later, the sender of the bomb was revealed to be May Picqueray (1893–1983), a militant anarchist and editor of Le Réfractaire. ^ Lisa N Sacco (2007-10-30). Chermak, Steven; Bailey, Frankie (eds.). Crimes and Trials of the Century. Westport Connecticut: Greenwood Press. p. 25. ISBN 9780313341106. Retrieved 3 October 2015. ^ Joughin, pp. 42–43, 45–46; Ehrmann, 115ff. ^ Amerika-Institut: Last Statements (1927), Nicola Sacco and Bartolomeo Vanzetti Archived 2011-07-19 at the Wayback Machine; accessed June 22, 2010. ^ Reed 1960, p. 869. ^ Ramsland, Katherine. "Ballistics: The Science of Guns". truTV. Retrieved 9 July 2010. ^ Reed 1960, p. 868. ^ Watson, Bruce, Sacco and Vanzetti: The Men, The Murders, and the Judgment of Mankind, p. 126: Upon questioning by the prosecution, witnesses testified that the shop's incorrect labeling of Berardelli's revolver as a .32 instead of a .38 was a common mistake, as there were few outward visible differences between the .32 and 38-caliber Harrington & Richardson five-shot revolvers. ^ Avrich (1991), Sacco and Vanzetti: p. 199: Note: Orciani, who did not testify at trial, was the same person who had helped Mario Buda escape the police trap on May 5, 1920 at the Johnson garage via motorcycle. ^ Avrich (1991), Sacco and Vanzetti, pp. 158, 189, 202: Both Orciani and Falzini (Falsini), like Sacco and Vanzetti, were Galleanists. ^ Frankfurter, Felix. "The Case of Sacco and Vanzetti". The Atlantic Monthly. The Atlantic Monthly Group. Retrieved 2 October 2015. ^ Sacco, Lisa (2007). "2". In Chermak, Steven; Bailey, Frankie (eds.). Crimes and Trials of the Century. Westport Connecticut: Greenwood Press. p. 30. ISBN 9780313341106. ^ Sacco and Vanzetti, Letters, pp. ? ^ Joughin, Louis; Morgan, Edmund M. (2015). The Legacy of Sacco and Vanzetti. Princeton University Press. pp. 114–115. ISBN 978-1-4008-6865-0. ^ a b c Evans, Colin, Casebook of Forensic Detection: How Science Solved 100 of the World's Most Baffling Crimes, New York: Penguin Publishers Ltd., ISBN 978-0-425-21559-3 (2007), pp. 12–23: "Doctor" Hamilton was not actually a doctor, but a former patent medicine salesman. He acquired a self-taught reputation as an expert firearms witness, though his testimony had been called into question as early as 1918, three years after Hamilton had testified in a New York murder case, People v. Stielow, that scratches on the barrel rifling of a revolver claimed to be Stielow's exactly matched marks on the bullet that killed the murder victim. Stielow was convicted and sentenced to death, and was only saved from execution after another man confessed to the murder. Subsequent new forensic examinations of both pistol and bullet demonstrated conclusively that no 'scratches' existed and that Stielow's revolver could not have been the murder weapon, and Stielow received a full pardon from the governor of New York. ^ Watson, 265–73; Young and Kaiser, 141ff. ^ William David Sloan and Laird B. Anderson, eds., Pulitzer Prize Editorials: America's Best Writing, 1917–2003 (Wiley-Blackwell, 2007), 3rd edition, 33–6. Reprinted in Topp, Sacco and Vanzetti Case, 158–60; Frankfurter, Case of Sacco and Vanzetti, 115–8. Available online: Google Books. ^ Young and Kaiser, 106. ^ Philip Cannistraro, "Mussolini, Sacco-Vanzetti, and the Anarchists: The Transatlantic Context," in Journal of Modern History, vol. 68, No. 1 (March 1996), 31–62. Italy had deported one of his attackers, Violet Gibson, to Great Britain. ^ Tropp, 171, Mussolini's telegram to the Italian consul in Boston, July 23, 1927. ^ For Vanzetti's complete statement to the court, from which this quotation is excerpted, see "Last Statement of Bartolomeo Vanzetti, 1929". Retrieved Aug 24, 2013. ^ a b Ehrmann, 255–6, 375, 512, 525ff. ^ New York Times: "Advisers Hold Guilt Shown," Aug. 7, 1927, accessed Dec. 20, 2009; Later Grant allowed that he was "amazed and incensed" at the biased comments Judge Thayer made outside the courtroom. ^ Steel, Ronald (1980). Walter Lippmann and the American Century. Boston: Little, Brown. p. 229. ISBN 9781412841153. ^ "Sacco and Vanzetti: Murderers or martyrs?". The Washington Times. The Washington Times. August 24, 2007. Retrieved 6 October 2014. As anarchists, both were militant atheists to the point of refusing to be consoled by a priest in their final hours. ^ Bortman, 60: "An East German scholar researching in the Soviet Union archives in 1958 discovered that the Communist Party had instigated these 'spontaneous demonstrations.'" ^ New York Times: "Fuller Spurns Book of Sacco Letters," January 4, 1929, accessed July 28, 2010; Watson, 352. Garner Jackson, a longtime supporter of the defense, presented the volume, which carried an inscription warning the Governor that he would always be watched and paying tribute to its authors as "victims not of the laws but of men." ^ The New York Times: F. Lauriston Bullard, "Proposed Reforms Echo of Sacco Case", December 11, 1927, accessed June 22, 2010. Note: Bullard had written the Boston Herald's Pulitzer Prize-winning editorial earlier in the year. The Times explained that the Judicial Council was a body established by law in 1924 to recommend legal changes. It included lawyers and judges named by governor, including a judge or former judge of the SJC. ^ Avrich, Paul, Anarchist Voices, pp. 132–133. Quote: "Buda also told me that Sacco took part in the Braintree hold-up. 'Sacco was there' (Sacco c'era), he said. I remember it distinctly. I felt sure he was telling the truth. I didn't ask him who else was involved, but he didn't mention Vanzetti, and I assumed that he was not." ^ Russell, Resolved, 109-10, 225–6. Russell publicized Ramuglia's story in 1986. ^ The son reported this to Francis Russell in November 1982, who made it public in 1986. Francis Russell, "Clinching the Case," in New York Review of Books, March 13, 1986. ^ Newby, Richard. "Judge Wyzanski Makes History: Sacco and Vanzetti Reconvicted", Writing, Univ. of Pennsylvania, August 29, 1999; accessed July 31, 2008. ^ "Sinclair Letter Turns Out to Be Another Expose", Los Angeles Times; accessed January 20, 2015. ^ Greg Mitchell. "Sliming a Famous Muckraker: The Untold Story", editorandpublisher.com; accessed January 30, 2006. ^ "Proclamation by the Governor" (1977), 797–9; also included in Young and Kaiser, 3–4, and Tropp, 182–4. ^ "Massachusetts Admits Sacco-Vanzetti Injustice". New York Times. 19 July 1977. Retrieved 2 June 2010. ^ "Governor Dukakis Discusses Impending Exoneration of Sacco and Vanzetti" (PDF). iCue interview transcript. 23 August 1977. Archived from the original (PDF) on 16 March 2012. Retrieved 2 June 2010. ^ "The Case That Will Not Die". New York Times. Editorial. 22 May 1977. Retrieved 2 June 2010. An editorial on the occasion of the publication of Katherine Anne Porter's The Never-Ending Wrong, urging Dukakis "to concede that Massachusetts justice did not acquit itself well in this case and to acknowledge the enduring doubts about it." ^ Evie Gelastopoulos, "Sacco, Vanzetti memorial unveiled," in Boston Herald, August 24, 1997. ^ James Thurber and Elliott Nugent, The Male Animal (NY: Samuel French, 1939), 1, 15–7, 41, 128ff. ^ Jay Reiner, "Theater Review: Voices On The Wind American Renegade Theatre," The Hollywood Reporter, April 5, 2000. ^ "The Wheels of Justice, Circa 1927, via a Robot and Herky-Jerky Puppets". New York Times. December 8, 2014. Retrieved April 23, 2014. ^ "Friday". The Times-Record. New York, Troy. May 28, 1960. p. 46. Retrieved June 12, 2016 – via Newspapers.com. ^ Schieb, Ronnie (March 29, 2007). "Sacco and Vanzetti". Variety. Reed Business Information. Retrieved August 6, 2010. ^ "Sacco and Vanzetti: Murderers or martyrs?". The Washington Times. News World Communications. August 24, 2007. Retrieved August 6, 2010. ^ H. G. Wells, Mr. Blettsworthy on Rampole Island (London: 1928). ^ "Kurt Vonnegut on Jailbird, His Watergate Novel". WNYC. 26 December 2013. Retrieved 23 August 2017. ^ Manning, Shaun. "Geary Recounts "The Lives of Sacco & Vanzetti"". CBR.com. Retrieved 4 January 2019. ^ ""They Are Dead Now": Eulogy for Sacco and Vanzetti". gmu.edu. Paul Avrich, Anarchist Voices: An Oral History of Anarchism in America. Princeton, NJ: Princeton University Press, 1996. Paul Avrich, Sacco and Vanzetti: The Anarchist Background, Princeton, NJ: Princeton University Press, 1991. Eli Bortman, Sacco & Vanzetti. Boston: Commonwealth Editions, 2005. Herbert B. Ehrmann, The Case That Will Not Die: Commonwealth vs. Sacco and Vanzetti, Boston, MA: Little, Brown and Company, 1969. Howard Fast, The Passion of Sacco and Vanzetti, A New England Legend. New York: Blue Heron Press, 1953. David Felix, Protest: Sacco-Vanzetti and the Intellectuals, Bloomington, IN: Indiana University Press, 1965. Felix Frankfurter, "The Case of Sacco and Vanzetti," Atlantic Monthly, March 1927. —Reprinted in book form as The Case of Sacco and Vanzetti: A Critical Analysis for Lawyers and Laymen. Boston: Little, Brown and Company, 1927. Brian Harris, "Injustice." Sutton Publishing. 2006. G. Louis Joughin and Edmund M. Morgan, The Legacy of Sacco and Vanzetti. New York: Harcourt, Brace and Company, 1948. Murray Kempton, Part of our Time: Some Monuments and Ruins of the Thirties. New York: Simon & Schuster, 1955. Eugene Lyons The Life and Death of Sacco and Vanzetti. New York: International Publishers, 1927. Eugene Lyons, Assignment in Utopia. New York: Harcourt Brace, 1937. Robert Montgomery, Sacco-Vanzetti: The Murder and the Myth. New York: Devin-Adair, 1960. Michael Musmanno, After Twelve Years. New York: Alfred A. Knopf, 1939. John Neville, Twentieth-Century Cause Cèlébre [sic]: Sacco, Vanzetti, and the Press, 1920–1927. Westport, CT: Praeger, 2004. Richard Newby, Kill Now, Talk Forever: Debating Sacco and Vanzetti. Bloomington, IN: AuthorHouse, 2002. Katherine Anne Porter, The Never-Ending Wrong, Boston: Little, Brown, 1977. Report to the Governor in the matter of Sacco and Vanzetti, Boston: Commonwealth of Massachusetts, 1977. Francis Russell, Sacco and Vanzetti: The Case Resolved. New York: Harper & Row, 1986. Francis Russell, Tragedy in Dedham: The Story of the Sacco-Vanzetti Case. New York: McGraw-Hill, 1962. Nicola Sacco and Bartolomeo Vanzetti, The Letters of Sacco and Vanzetti. New York: Octagon Books, 1928. 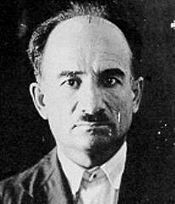 Nicola Sacco, The Sacco-Vanzetti Case. New York: Russell & Russell, 1931. Sacco-Vanzetti: Developments and Reconsiderations – 1979, Conference Proceedings, Boston: Trustees of the Public Library of the City of Boston, 1979. James E. Starrs, "Once More Unto the Breech: The Firearms Evidence in the Sacco and Vanzetti Case Revisited," in Journal of Forensic Sciences (1986), pp. 630–654, 1050–1078. Susan Tejada, In Search of Sacco & Vanzetti: Double Lives, Troubled Times, & the Massachusetts Murder Case that Shook the World, Boston: Northeastern University Press, 2012. Moshik Temkin, The Sacco-Vanzetti Affair: America on Trial. New Haven, CT: Yale University Press, 2009. Lorenzo Tibaldo, Sotto un cielo stellato. Vita e morte di Nicola Sacco e Bartolomeo Vanzetti, Turin: Claudiana, 2008. Michael M. Topp, The Sacco and Vanzetti Case: A Brief History with Documents. Boston: Bedford/St. Martin's, 2005. Bruce Watson, Sacco and Vanzetti: The Men, the Murders, and the Judgment of Mankind. New York: Viking Press, 2007. Robert P. Weeks, Commonwealth vs. Sacco and Vanzetti. Englewood Cliffs, NJ: Prentice-Hall, 1958. William Young and David E. Kaiser, Postmortem: New Evidence in the Case of Sacco and Vanzetti, Amherst, MA: University of Massachusetts Press, 1985. This page is based on the Wikipedia article Sacco and Vanzetti; it is used under the Creative Commons Attribution-ShareAlike 3.0 Unported License (CC-BY-SA). You may redistribute it, verbatim or modified, providing that you comply with the terms of the CC-BY-SA.